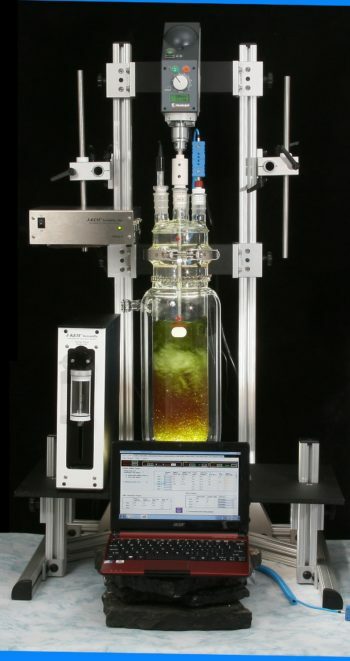 The Reaction Controller automates the reaction process by controlling reagent addition, temperature control, stirring, data collection and any other required parameter through a single interface. It consolidates the control of various lab instruments such as recirculating chillers, stirrers, and pumps into a single graphical interface. Additionally, the Reaction Controller data log system parameters such as temperature and solution pH. Adding a syringe pump to the Reaction Controller provides all the functionality of J-KEM’s single syringe pump and automates the addition of multiple reagents to the reaction as a function of time, temperature, and pH. The genius of the Reaction Controller is that the user can change the sensors read (pH probe, thermocouple, etc.) and the instruments controlled (chillers, stirrers, pumps, etc.) as the user’s research needs change.